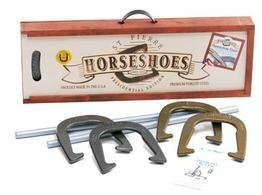 Proudly made in the USA, the St. Pierre American Presidential horseshoe set includes all the necessary items for 2- to 4-person play including 4 American horseshoes with hammertone finish, two 24-in long solid steel stakes, and an official rulebook with court layout instructions. The contents come in a mahogany stained box with natural wood cover and heat-branded graphics. For 2 to 4 players. Includes 4 solid steel horseshoes with a baked-on, non-slip finish that is electrostatically applied. Finish is more resistant to chipping, corrosion and weathering than other coatings. Also includes two 24-in solid steel stakes, rulebook and a carry box. Proudly made in the USA. If you have any questions about this product by St. Pierre, contact us by completing and submitting the form below. If you are looking for a specif part number, please include it with your message.